Kelly's Korner: Whooooooooooooo pig sooie!!!! My weekend started off great. I LOVE mail. LOVE it! and when I got home on Friday - I had a package from one of my favorite bloggers, Jenna. She is TOO MUCH! She sent me the sweetest card in which she wrote a lot of very encouraging words and she made me a magnet that is awesome and she got me some earrings that are SO ME!!!! Jenna reminds me of someone I would have been friends with in college (or now). She is funny and so thoughtful and just someone you want to be around!!! Today has been a great day for the Razorback nation! First was the NFL draft. 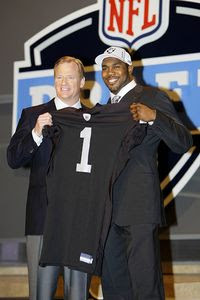 My boy Darren McFadden went 4th to the Raiders. Now I could care less about the NFL - especially about the Raiders but I believe I will be watching some games this year. And I'm especially excited that Felix Jones went to the Cowboys because Scott is a huge Cowboys fan and I might like watching some of their games with them if I can catch one of my favorite former Hogs. Scott and I went and had an early dinner at Outback. When I say early - I mean we were there at 4:15 (with the blue hairs). ha! I was so excited to eat a real meal that did not come from a frozen box. It was so good. This is Scott watching the draft intently while we ate. (when he wasn't texting his friends). Then we went to the Spring Red/White game. We were so pumped because there was a great turnout. I've heard there were between 40-45,000! It was so fun! Here we are - getting ready to call the hogs! I never get tired of watching the players run out of the A!!!! We are so excited about our new coach and the years to come!!!! We left at halftime and went to Target and Old Navy and got Scott several pairs of shorts and three pairs of flip flops and some sunglasses and shirts. He should be set! I've got to get to bed - I have an early morning teaching those wild four year olds!!!! Thank you for being a huge Hog fan...although I don't share your love of the Razorbacks, I do share your super school enthusiasm for my own school "Gig'em Ags!" and it's nice to see I'm not the only one who still gets a little crazy,psycho about their alma mater! It was a very good weekend for the Razorbacks!! We had a great time at the Red-White game...now I can't wait for real games in the fall. I'm with ya sista' I love getting mail!! And what a thoughtful thing for a fellow bloggirl to bless you with!! Jenna Rocks!! Glad you are getting ready for Hawaii that will be too fun!!! I miss living in Arkansas sometimes, especially because I'm as crazy about the HOGS as you are! Sounds like you had a fun Saturday. Hey Kelly...did you take the bottom pic from your season ticket seats? 'Cause my dad's tickets are on the opposite side of the field, and up a little higher (one of those few rows that are covered!) If I come this fall, I'll know where to look for ya! Oh I love getting mail, too. Those earrings are precious. I love to go eat with the blue hairs, especially at Outback, since if you wait until 7:00 you have to wait forever for a table. If we go to Outback we always go early. Derek will be so jealous you got to go to the R/W game. He was soooo excited for Darren but I think he was even MORE excited about Felix! YAY for football, YAY for good friends and real mail, and YAY for just a good weekend overall!!!! I must say I have a little vacation envy - you go to Hawaii in less than two weeks!!! I can't wait to see pictures! Hawaii is on my "pie chart" of things to do before I die! So is being a Titan's season ticket holder! Come to think of it... what would be on your "pie chart" of things you just want to do/have before you head out of this place and on to eternity in Heaven? I am so excited for D-Mac too!! I can't wait for football season to start! Yay!! Prizes are fun. :) I am SO glad you liked it all. I don't know this Jenna, but YES, you would have loved her in college. Good grief, have you told her about your extensive card making days then??? And that was when there were no good tools to work with! All you really need to know about her now is whether she can list out all 104 episodes of the Brady Bunch and y'all are set. I have fond memories of me trying to study while you watched Brady Bunch and made cards for people. On another topic, I covet that swimsuit! I may have to go see if they have it at the TJ Maxx here. It's not like we'll be swimming together this summer so no big deal if we have the same one. And on the use of my word "covet", I found myself using this word this morning in SS to tell a girl in my class that I liked her shoes. It reminded me of when we use to go to Church on Sunday nights at FBC Arkadelphia and Snookie Dixon would say that she coveted our prayers and we would find that odd. Oh well! I'm now a heavy user of the word. I'm so happy for you and your Razorbacks. I of course don't "get it" but Lance has been giddy all weekend, too, and I love for the people I love to be happy. How sweet of Jenna! That is precious! Your weekend looks like it was fun! By the way, the sunglasses look awesome! Love them! Hi - I like your blog! Unfortunately, my husband's family is from Alabama, so we're big BAMA fans!! We're teaching our 2 year old to say, "Roll Tide!" My brother lives in Conway. Is that close to you? Okay, I am having a fit of the giggles because David (my hubby) uses the phrase blue hairs all the time! Until we started dating I'd never heard of it and he is the only one, until now, that I have heard say it! Looks like y'all had a fun day! I can't believe what a great friend Jenna is to you...shoot, my close friends aren't even that "gifting!" You guys are huge football fans, like us!!! That's so fun :) We were excited that T.Brown from UGA got drafted by the Falcons...we love it when hometown boys go to the Dirty Birds! What a sweet (and adorable!) card! Cute earrings. I love getting mail too. I'm obsessed with checking it every single day, except Sunday.